We are specialists in Dry Solids Handling and Process Engineering for the design, supply, installation and commissioning of complete automatic process plants to a variety of industries. For that purpose TBMA manufactures an extensive range of standard process equipment with a proven reliability . With this bulk handling equipment, TBMA is not only building turn-key projects but also sells their components to OEM’s (Original Equipment Manufacturers) and End-users via our distributers abroad. Our equipment find their ways in the following industries; chemical, paint, ink, food, plastic, cement, dairy and compounding industries. Manufacturer of solids handling equipment looks for OEM's and distributers, rotary valves, divertervalves bigbag loading and unloading, bagslitting machinery etc. TBMA is an international engineering and manufacturing company based in Holland and Belgium with sales representation and service facilities across Europe, Asia and Australia. 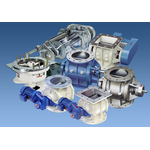 We are looking Globally for OEM’s for the above mentioned products.OEM’s who are active in one or more of the mentioned industries, engineering and manufacturing machinery for solids handling.